As I was laying in the bath the other night, I was staring up at the shelves and the vast collection of shampoo bottles, lush things, various hair dyes and toys. Lots of toys. It suddenly occurred to me that there isn’t a single room in our flat that Clem hasn’t taken over. Since she came along our whole flat has changed. She obviously has her own room which used to be our spare room. That is now filled with furniture, clothes, toys, a play tent, a whole library’s worth of books and more toys. Then there’s the lounge – again more toys, her train set, an arts and crafts corner. Open any cupboard in the kitchen and I guarantee a plastic plate or sippy cup will fall out. I’ve already mentioned the bathroom but in there we have the nappy bin, bath toys, various other bits and bobs like wipes etc.. Even in our bedroom you can usually find a toy under the bed, or something belonging to Clem in there. The balcony is probably the only place she hasn’t claimed as hers yet and that’s only because the weather hasn’t been good enough to go out there. I’m guessing as soon as we have more than 2 nice days in a row she will be out there claiming it as hers. I really need to go through Clems toy box and sort out things she hasn’t played with or looked at in the last few months. This would really help to cut down on the amount of stuff she has. However it’s not just the toys and things that have changed the way our house is. I never knew just how squeaky our floorboards were until it came to bedtime. I’m fairly certain they are getting worse as well. I’ve now worked out the correct places to step on the way out of the room so that I don’t make noise. You will also come to realise that carpet and babies do not go well together. After a particularly bad few weeks when Clem was ill and threw up quite a bit, we decided to get our carpets cleaned – turns out it was actually pretty pointless. They didn’t really come up very well and within a day or two there was already loads of stains back on it. So we decided to investigate and see what was under the carpet in the lounge. We discovered we have pretty nice parquet flooring in a fairly good condition so we immediately took up the carpet and now it’s great. It doesn’t matter when Clem drops food or flings pasta sauce everywhere. We can just wipe it up, I wish we had done it sooner. The front of our fridge is now filled with pieces of artwork and paintings she has done, which I love. It’s a lot nicer than a shopping list or some old magnets. My shelves by my desk have a mother’s day card that she made and a few other little bits of crafts we’ve done. Our walls suddenly became filled with photographs, becoming like a portrait gallery or a shrine. I haven’t even mentioned the baby proofing, although if I’m honest we didn’t actually do a lot. We don’t have stairs, she learnt pretty quickly to avoid the oven and a certain cupboard in the kitchen. After shutting her fingers in a drawer on the tv unit we bought locks for them and we bought safety covers for the plugs. Apart from that it’s been ok.
Our house is constantly messy despite my constant tidying up. I can tidy the lounge, walk into the kitchen and come back in to find it worse than before I started to tidy. Our house will never be Instagram perfect, and that’s ok. At the end of the day once Clem is in bed we tidy away her toys but come morning they all come back out again. 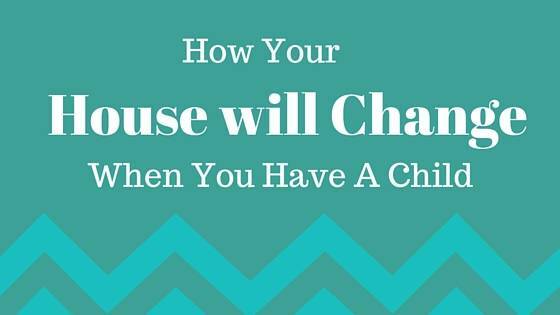 Has your house changed since having a child? Were you ready for it? Do you have any great ways of keeping mess to a minimum, I would love to know! Yep, I can relate to this. It is just constant; non-stop tidying. Everything and everywhere in our house is filled with kids things. But that’s what makes memories and I love it! Haha! Sometimes I forget I even have carpet and not just a layer of toys and clothes.